Please join the DUNN’S MARSH YARD AND GARDEN TOUR, this Saturday, June 25. 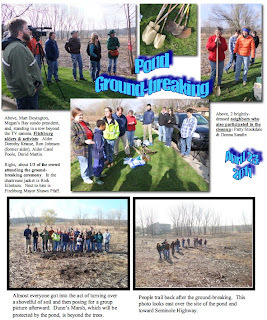 Read about it and several other events, plus the usual blend of articles in this issue of the Dunn’s Marsh Neighborhood e-News. Don’t forget, the YARD AND GARDEN TOUR starts at 10 a.m. from Prairie UU Society this Saturday. No calendar this time since events are in time order. 8 - How Will State Changes in the Law Affect Local Stormwater Management? 9 - Adoption Fees for Adult Cats Reduced 85%! 10 - Every Day is Spay Day at Dane County Humane Society! Building on the success of last year’s back yard chicken coop tour, the DMNA is sponsoring this year’s Yard and Garden Tour. The tour starts at 10 a.m., this Saturday, June 25,.from Prairie UU Society, corner of Whenona and Crawford Drives. The tour is a chance to view and learn about some seldom-seen back yards as well as all the front yards we’ll be passing by. Even if you have driven by those front yards a million times, you’re guaranteed to see more during this walk, since the focus is the yards, not keeping a car on the road or watching for kids. Amazing, the difference being on foot makes! At a minimum you’ll see a prairie yard, a “wild” yard, a yard in transition from lawn to edible landscape and native plants, and a yard full of perennials. Besides the yards, we’ll be stopping by the Marlborough Park rain garden and then checking out the community gardens in Marlborough Park. A recent tour of the community gardens showed some spectacularly-well-kept gardens (as well as some that could use a little more elbow grease). Finally, if any of the group feels like it, we will also trek on down to the Apache wet pond to see how construction has progressed. It’s a neighborhood outing to which all in the Dunn’s Marsh Neighborhood are invited. People from apartments are especially welcome including those in the Allied section of the neighborhood. We plan to do this tour rain or shine. If it’s raining, just come dressed for the weather. Does anyone out there in readerland have a few tomatoes looking for space? Or have you been drooling over the beautiful petunias that still fill the tables at garden stores? Either way, these flowers could be at home in the Marlborough Community Garden. Two plots are still available in the garden that is in Marlborough Park in the middle of the neighborhood. Just call Nicole Craig 246-4730, extension 208, or reach her on her cell phone at 220-9001. Since it is so late in the season, you might ask if you could have a plot for a reduced fee. Better that the plot be used than having it grow into weeds that have to be mowed off. The City of Fitchburg invites residents to attend a public information meeting and discussion regarding a development plan for 260 acres of commercial and industrial land along McKee Road, east of Verona Road. The City has recently initiated a planning process to plan for infill development and infrastructure improvements in this area. This six-month process began in June and plan adoption is anticipated in November. Interested residents are asked to attend thismeeting to learn about the planning process and share any ideas or concerns about land use, traffic, stormwater, or other issues. Vincent Smith is a UW researcher who organized a huge research project last year to investigate home, community, and school gardening as well as other community-based food production initiatives around Madison. The research required participants to weigh all their produce to the tenth of an ounce and also record all expenses and time spent gardening. At least one Marlborough Park community gardener participated in this research (myself, the writer of this article). Mr. Smith will be talking about his research on Friday, July 8 at 1:00 p.m. at 175 Science Hall, 550 N. Park Street, the big red building across from the Memorial Union on the UW campus. Attend this talk to learn more about the value of these community food production systems for practitioners (gardeners) and for the community as a whole. The talk is free. The Wisconsin Department of Transportation (WisDOT) is designing improvements for the reconditioning of the County PD (McKee Road) intersection with US 18/US 151 (Verona Road) in Dane County. WisDOT has hired Strand Associates, Inc.® to assist with the project design. Work will include adding an additional left-turn lane to the County PD (McKee Road) eastbound and westbound intersection approaches to minimize existing congestion and mitigate future construction traffic for the upcoming Verona Road Interchange project. Construction is currently scheduled for 2012. Tuesday, July 12, 2011, 5 to 7 P.M.
At this meeting, attendees will be able to view exhibits of the proposed project and possible effects on properties. Project representatives will be available to answer questions and receive comments. Those who are hearing impaired and require an interpreter should contact WisDOT by July 5, 2011. Please dial 711 to contact the Wisconsin Telecommunication Relay System, and then ask the communication assistant to contact Mike Rampetsreiter of WisDOT at (608) 246-7917. For additional information about the CTH PD project, contact the WisDOT project manager, Mike Rampetsreiter, at (608) 246-7917. Written comments can be directed to Mike Rampetsreiter at WisDOT Southwest Region Office, 2101 Wright Street, Madison, WI 53704. Please refer to project I.D. 1206-07-07. Stormwater runoff is an issue that often comes up during many of our construction projects. The only way to minimize runoff is to maximize infiltration. This can be challenging with a street reconstruction. However, as part of the Allied Drive Redevelopment Project, we installed a 3’ wide permeable concrete strip down an alley. The alley water is designed to drain to the center, infiltrate through the pavement and act as groundwater recharge system. Installation of permeable concrete is very labor intensive, which is why only the center strip was installed. Engineering staff will monitor the effectiveness of the pervious pavement during the summers of 2011 and 2012. Sampled water shall be tested for phosphorous, metals and select pesticides. reconstruction or resurfacing project. The cost sharing is now capped at $400 for the homeowner or $350 if the owner purchases and installs plants on their own. We are installing 21 rain gardens in association with our resurfacing projects and 14 with street reconstructions. Our total number of terrace rain gardens will more than double this year. Those of you who have been following changes proposed by the state legislature know that stormwater management is not exempt. The State is proposing to repeal the requirement that municipalities remove 40% of total suspended solids in runoff by October 1, 2013. How will this and other changes affect us? While some of what we do is a result of regulation at the state level, Madison has always been committed to improving stormwater quality because it is the right thing to do. The City and County have already gone beyond the current minimum state requirements, with the intention of improving the condition of our lakes and rivers, and we will continue to do so. Here in Madison, and I believe in the surrounding communities as well, the commitment to the environment remains strong. Join Dane County Humane Society in celebrating Adopt a Cat month. We've set an important goal of adopting 150 cats before the end of June and we need YOUR support to make it happen. We are offering significantly reduced adoption fees - only $5 - on all cats 6 months and older. You're saving almost 85% off normal adoption fees while also saving a life. Please help us help our homeless cats find new loving homes today! Conceal Carry: I am a lead sponsor of a law banning any concealed weapons from county buildings, including the airport and office buildings. This is in response to the state proposal allowing individuals to carry concealed weapons almost everywhere in the state. At the time of my writing this, the state is considering allowing local governments to ban concealed weapons in closed buildings only, but the state’s bill is still changing and I expect more details in the coming weeks. Tornado Sirens: The County is updating its tornado sirens to improve the specificity of which sirens go off in an emergency. Currently, the county is divided into 6 siren areas, and whenever a tornado warning is required in any part of an area, the entire area’s sirens are activated. The result is sirens going off in neighborhoods that are not at risk. This leads people to ignore the sirens, diminishing their effectiveness and potentially putting lives at danger. The new system allows county staff to activate each siren individually (in approximately the same time as it currently takes to activate an entire area). This will ultimately make us safer by allowing citizens to better rely on the sirens, and it will save our ears from unnecessary warnings. Forced Privatization: A new state budget provision requires county governments to privatize all construction projects costing more than $100,000. This includes 100s of projects a year—from road reconstruction to building upkeep and facility improvements (think zoo, airport, Badger Prairie Nursing Home, city-county building). This will almost certainly increase county costs for projects and lead to layoffs of our experienced county highway workers. Slow No Wake and Veto: There is considerable land erosion on the beaches and property that abuts Lakes Monona, Mendota, and Wingra, due to the higher than normal water levels. But the current process to issue slow/no wake order to boaters on the lakes is laborious. After a year of work, the county board approved a new, streamlined process. However, County Executive Joe Parisi vetoed the changes because he felt the approved law did not get enough public vetting. While I am disappointed, I am hopeful that the changes will get a new public hearing and make their way back to the county board. Huber Center: We have so successfully decreased the county jail population that we are closing a floor of the Huber Center (our minimum security housing for inmates with work-release privileges). Prisoners who otherwise have been housed at the Huber Center are now out on electronic monitoring (which actually keeps us safer with direct, individual tracking) or are getting mental health, alcohol, or drug treatment. No jobs were lost; all employees were transferred to other positions. Savings will come from building maintenance (heat, cleaning) and prisoner services (food, laundry). Redistricting: Every 10 years, as the new census data is released by the federal government, and the county (as well as the state and city) have to reconfigure their electoral districts. Bad news—Starting in April, I will no longer have the honor of representing DMNA. The county plan does not go into effect until the next local election in April, however, so I will still represent you until then. And of course, I will always be a resource and advocate for DMNA needs. Under the new redistricting plan, each supervisor will represent approximately 13,000 constituents. How many Dunn’s Marshians does it take to organize neighborhood garage sales? 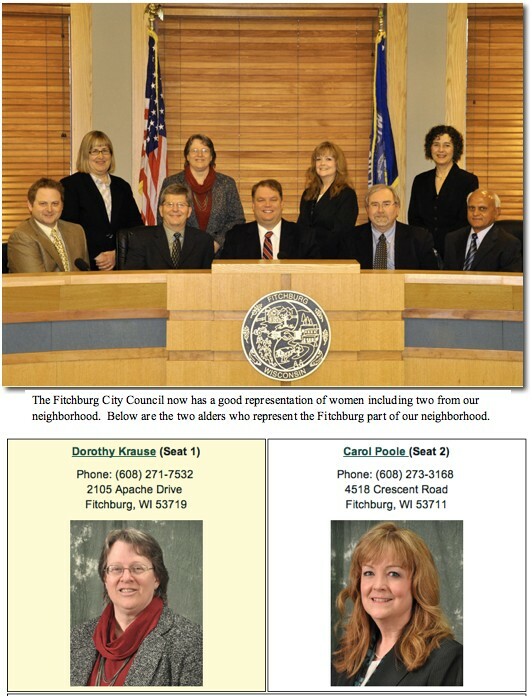 The one was DMNA Council member Donna Sarafin. Without her, there wouldn’t be any organized effort to have neighborhood sales this summer. But she did want to have her own sale, and then she offered to advertise the sales on Craigslist. At any rate, the sales will be held on this Saturday, June 11, from 9 a.m. until noon, rain or shine. There’s still time to sign up with Donna. If you are interested, contact her at dksarafin@yahoo.com or 273-0437. Oh, and the “maybe second person” that it took to get these sales off the ground? I offered to make the signs to direct people into the neighborhood. How often have you wondered just what your neighbor’s back yard looks like (but were afraid to ask to see it)? Kids have no trouble going into back yards, but we adults, well, that’s another matter. We’ve learned well not to trespass. On Saturday, June 25, starting at 10 a.m. the Dunn’s Marsh Neighborhood Association will be sponsoring and leading a Yard and Garden Walk. The idea is to visit a few yards and gardens to see what people are up to. Several very different kinds of yards/gardens will be part of the tour. We’ll be doing the tour on foot just like we did the chicken coop tour last year. Meet at 10 a.m. in front of Prairie UU Society, corner of Crawford and Whenona. There may still be a garden plot or two available in the Marlborough Park Community Garden. If you are interested, call Pablo Granados at 213-2612 or Nicole Craig at 220-9001. Both speak English and Spanish. Marlborough community garden will be getting a new shed from the MATC carpentry program later this month. The new shed will be larger than the existing larger shed. MATC can deliver the shed and help us situate it, but that means that the existing two sheds on site need to be removed by that time. If anyone would like to have one of the sheds (or both) for their own use (at their home or elsewhere, but not in the garden, though) they are welcome to take a shed for free. You must be able to remove the shed yourself. Please let me know via email nicolec@cacscw.org <mailto:nicolec@cacscw.org> or phone (220-9001) if you’re interested. The faint smell of fresh garlic, the fresh sound of red-winged blackbirds and robins singing, most of all, a sunny morning after days of rain - that was Saturday, April 23, the day of the Dunn’s Marsh Waterway clean-up, the Avalon Village clean-up, and the Allied Dunn’s Marsh Neighborhood Association Clean-up. Lots of people worked on giving the neighborhood a better look. Mostly adults worked on the Dunn’s Marsh Waterway Clean-up. They had first attended the ground-breaking for the Apache wet pond that is now being constructed below Crescent Road. This clean-up was organized by Rick Eilertson, Fitchburg’s Environmental Engineer. Cleaners from the neighborhood included - alphabetically by first name - Cathy Casper, Dave Martin, Donna Sarafin, Dorothy Krause, Mary Mullen, Matt Boyington, Patty Stockdale, and Ron Johnson. Three or four others from other areas also participated. Kids were the main workers in Avalon Village. Their clean-up consisted of picking up rocks off the lawns there. Kids that filled their bags were rewarded Easter baskets. This popular clean-up was led by Sina Davis who did a super job of organizing the kids. Other adults helped also. 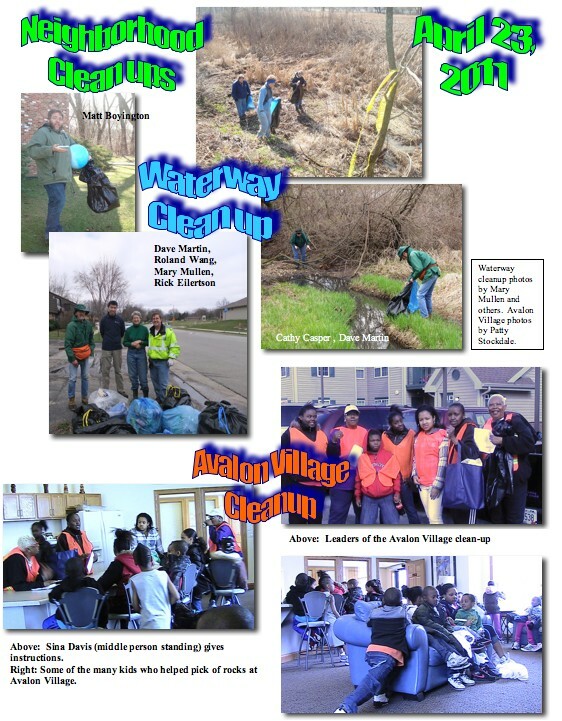 The third clean-up was sponsored by the Allied Dunn’s Marsh Neighborhood Association. Part of the group, mostly teenagers, spent time picking up litter on the Verona and Beltline frontage roads. The frontage road cleaners were led by Jo Kelley. Although lots of trash was removed from the neighborhood, litter continues to accumulate especially along the frontage roads, along the Beltline next to the traffic lanes, on business properties along Verona Road, at bus stops on the edge of the neighborhood, and near the CDA housing on Britta Parkway. Wouldn’t it be nice if everyone did their part by putting their trash where it belongs? The DMNA Neighborhood Council will now be meeting on the first Monday of the month. Time: 7 p.m. Place: Prairie UU Society, 2010 Whenona Drive. Dates for the summer are July 6, August 3, and September 7. There will be no Council meeting in June. Any resident may attend a Council meeting, but only Council members can vote. Let President Jeff Glazer know if you plan to visit. His contact information is in the masthead. The two neighborhood associations that cover the Dunn’s Marsh Neighborhood have scheduled their traditional summer celebrations. The ADMNA will hold their Festival in Belmar Park on Saturday July 30 during the daytime hours. The DMNA invites the neighborhood to share an “after work” potluck picnic at Marlborough Park on Friday, August 5. Put these events on your calendar now, and come join your neighbors at both celebrations. Those who drive Crescent Road are treated to a changing scene as Iverson & Sons shapes the new wet pond. 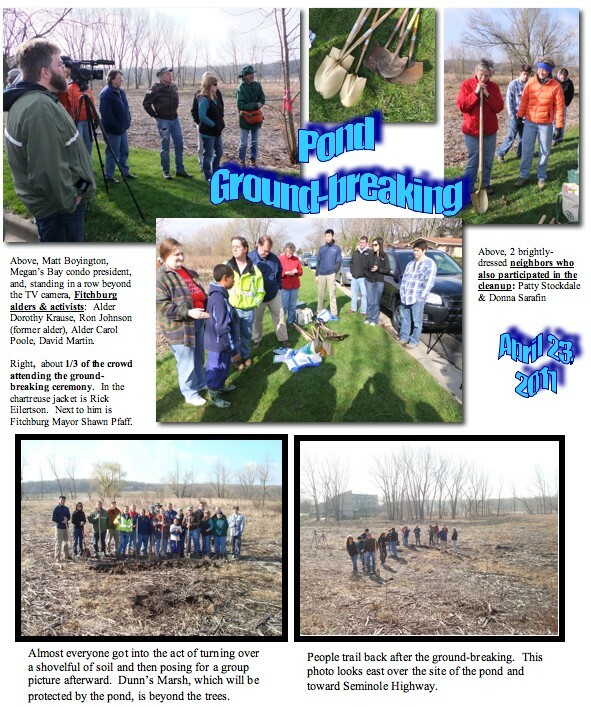 Ground-breaking for the pond took place on April 23. The ceremony was attended by about 2 dozen people including many from the Dunn’s Marsh Neighborhood and others who were involved in the planning of the pond. Fitchburg Mayor Pfaff was there as well as Fitchburg Alder Carol Poole who lives across the street from the project and Alder Dorothy Krause who lives at the top of Apache Drive. Those present heard about the history of Lots 19 and 20 and plans for the construction. Since the 23rd, more trees have been cut down and taken away. The sanitary sewer was moved, and the storm sewer was rerouted. Now two ponding areas have been shaped although it looks like one with the pond full. Check out the collage of the pond ground-breaking event and the second one showing construction progress. 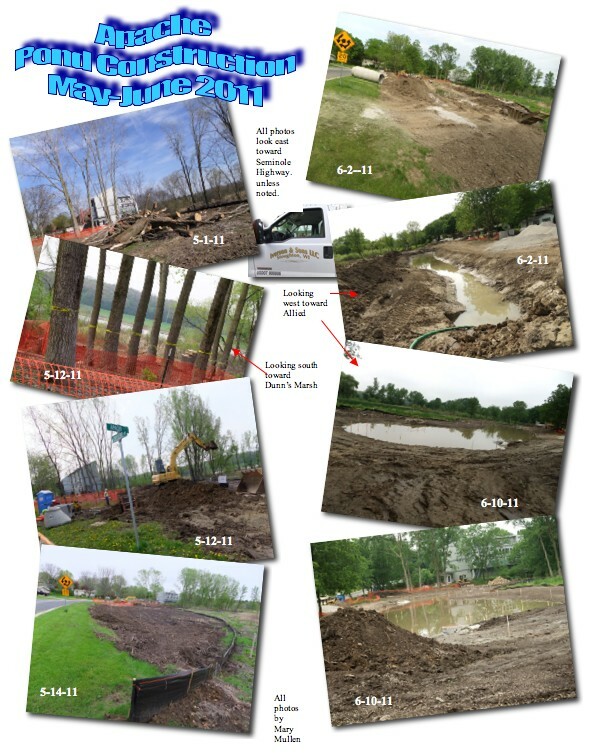 The pictures show not only construction changes, but the progression of the season from early spring with hardly a tinge of green in the trees to the luscious leafiness of early spring. When finished, the land surrounding the pond will be seeded to native grasses and flowers, and a walkway will let nature-lovers circulate around the perimeter of the pond. Interestingly, when I visited on June 2, a mallard was swimming in the new pond. Unfortunately, the water he was swimming in had a rainbow sheen of oil on its surface. The purpose of this pond is to trap sediment and prevent it from getting into Dunn’s Marsh and the waterways downstream including Nine Springs Creek, Lake Waubesa, and beyond. Like music? Like it even better free? 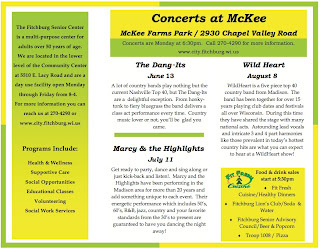 Then your cup of tea is the “Concerts at McKee,” held each second Monday of the month at McKee Farms Park, 2930 Chapel Valley Road, just off McKee Road (Co. Road PD), a couple of miles from our neighborhood. The concerts start at 6:30 pm. For more information, look at the attachment or call 270-4290. 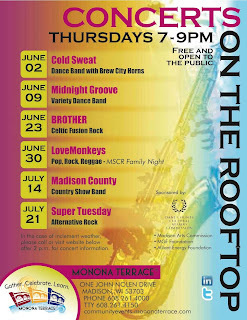 Monona Terrace announces the schedule of free and low cost community events available to the public this summer 2011 at the Frank Lloyd Wright designed facility. · Monona Terrace open house, Saturday, July 16, 1 pm (FREE TOUR, GOODIES,& GIVEAWAYS) offers the public a chance to tour one of Madison’s most iconic architectural works, and offers free treats and giveaways for the whole family! · The Lake Vista Café located on the Monona Terrace rooftop offers sweeping views of the Madison skyline and Lake Monona. Come experience what Monona Terrace has to offer our community. It’s a place to gather, celebrate and learn! Parking is available in the Monona Terrace parking ramp at One John Nolen Drive. For more information call 608.261.4000 or visit http://communityevents.mononaterrace.com <http://communityevents.mononaterrace.com> . 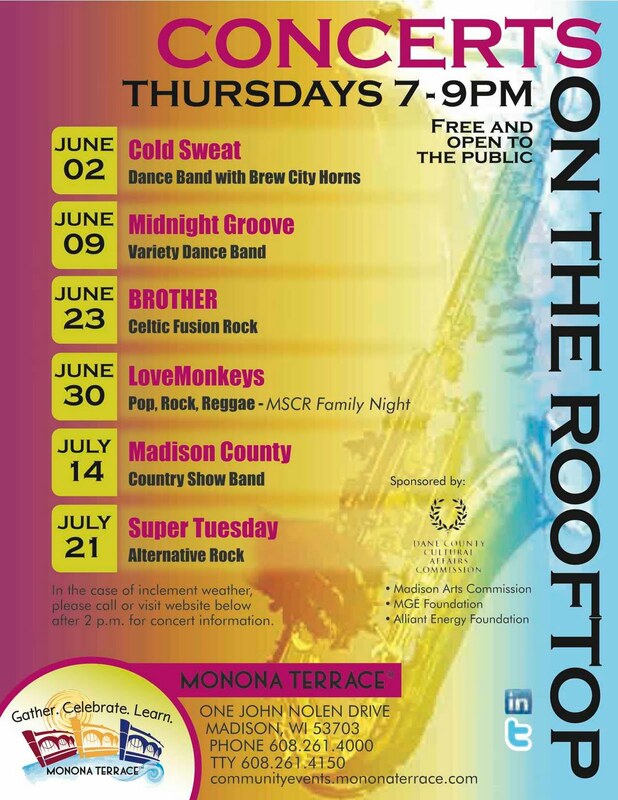 Become a fan on Facebook <http://www.facebook.com/pages/Madison-WI/Monona-Terrace-Community-and-Convention-Center/177810067314 > ! Madison B-Cycle is now underway. You’ve been hearing about it for months, and now you can actually rent bikes downtown with a swipe of your credit card. Madison B-cycle is an urban bike sharing program put in by Trek under an agreement with the City of Madison. It’s the new way Madison moves! Enjoy access to over 300 bikes throughout the capital city this summer! As of Sunday May 22, 2011 six stations have been loaded with bikes and the remaining stations and bikes will go live over the next two months. A 2011 annual Madison membership comes out to be only 30 cents per day so sign up today! Besides allowing down-towners to do short errands by bike, B-cycle could be a great way to have out-of town visitor do some biking downtown or to rent a bike for a day. Once you get a pass, the first 30 minutes of each trip is free. There’s a $2 charge for the second 30 minutes. Once you get beyond an hour, each additional 30 minutes costs $5. Fees are structured to encourage short trips with a return to a dock in between trips so that others have access to the bikes. See http://madison.bcycle.com/ for an interactive map that shows location of B-stations and how many bikes are normally there. You can also view a demo that shows exactly how to use B-cycle. Pull down the “About” menu item for additional details of how to use B-cycle. On Friday, June 3, all the bikes were checked out of the one on lower State Street, #6, above, and I saw people riding around on the bikes. They all had headlights and tail lights that continued lighting even when the bikes were stopped. Alert, active, and knowledgeable neighbors are what’s needed to keep crimes at bay and get things done. Below are some numbers you might want to post on your refrigerator or next to you phone. 911 - For true emergencies,* absolutely call 911. (See list of emergencies at end of article.) Use your own judgment about calling 911 when there’s something like a fight between kids, a minor car accident, or a verbal argument. DON’T ASSUME SOMEONE ELSE CALLED. SOMETIMES NO ONE HAS. · when a street light is out after business hours (otherwise call Traffic Engineering at 266-4767. The Literacy Network has an adult ESL - English as a Second Language - program called Community Literacy at the Allied Neighborhood Boys & Girls club that we really need volunteer tutors for. Community Literacy is designed to tutor adult ESL learners one-on-one in a classroom setting. Tutors help their assigned learner gain English speaking, reading, and writing skills. No experience or foreign language skills required! Successful tutors give their learners more than improved English skills -they offer the chance for them to gain confidence and improve their connection to the world around them. We need 5 volunteer tutors for the following class: Tuesday nights, 6-8pm at the Allied Neighborhood Boys & Girls Club (4619 Jenewein Rd). Anyone interested can contact Ms. Shawn Steen, Volunteer & Outreach Coordinator via email Shawn@litnetwork.org <mailto:Shawn@litnetwork.org> or at (608) 244-3911. Domestic Abuse Intervention Services (DAIS) will be offering a summer volunteer training in June and is looking for dedicated and passionate individuals to join the DAIS team! Volunteers are essential in providing services to our clients and are involved in every aspect of the work we do. Our volunteer program increases support services to victims by two-thirds of what staff alone can do. DAIS works to empower those affected by domestic violence and advocate for social change through support, education and outreach. We have been in Dane County for over 33 years working to make our community a safer, more just, more equitable place for people who have experienced domestic violence, their children, and the people who love them. I would like to take this opportunity to introduce you to Green Madison, a City of Madison program for energy efficiency designed to help homeowners’ make smart energy efficiency improvements while keeping the costs of improvements affordable. The residential portion of Green Madison launched in April 2011, with the commercial portion to follow in the next six – eight weeks. I’ll be glad to answer questions from interested homeowners. Common Wealth Development has money available to help landlords wishing to reduce the lead hazards in their rental properties. · Your tenants need to be low (80% of Dane County Median Income) or very low income (50% of Dane County Median Income). · Your properties also need to be occupied or suitable for occupancy for families with young children for your property to qualify for the available money. · For three years after you the work is completed, you will need to continue to rent to low or very low income tenants and market the apartments to households with children under the age of 6 years old. If your property qualifies and you agree to participate, Common Wealth Development will schedule a Partial Lead Inspection-Risk Assessment. The Department of Health will review the Inspection-Risk Assessment to ensure the scope of work addresses all the lead hazards appropriately. Common Wealth Development staff will discuss with you any available options for how the work is done. When the lead work order is approved and agreed upon, Common Wealth Development will request bids from certified lead abatement contractors and go with the lowest of the qualified bidders. You will be required to pay, in advance, 25% of the cost of the lead work. Once the work is done a clearance test will be done to confirm that all lead hazard work was done properly and the property is lead safe for re-occupancy. The program will re-locate tenants while the work is done. Landlords have used these funds to get new windows, cabinetry and siding. This is a great opportunity to treat lead hazards at a greatly reduced cost to you. Interested landlords should contact Diane Eddings at 256-3527 ext. 27. A confirmation will appear in your e-mail box asking you to finalize your registration. Click 'Back to My City of Madison Account' and 'Returning User.' Scroll down to the Senior Center; expand the list to reveal The Messenger. 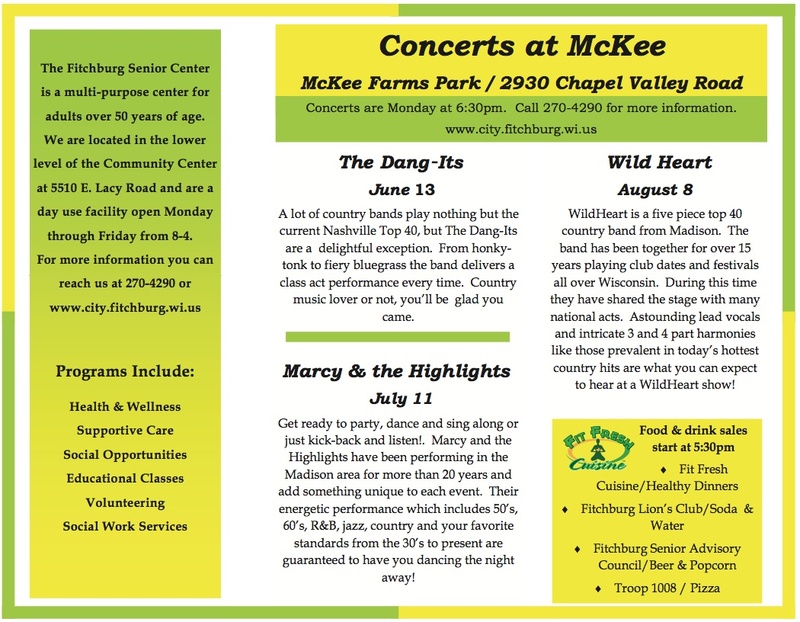 Put a check mark in the box and you will receive our newsletter by e-mail each month. Explore and subscribe to other City e-mail lists (parks, cultural arts, public health, etc.) by checking other boxes on the My Account pages. E-Mail Sign-Up. Parmans Take Two: The second Parman’s redevelopment proposal meeting is scheduled for Thursday, May 12, from 6:30-8:30, at Edgewood’s Predolin Hall, Anderson Room. Hope to see you there! Empire Take Two: There will also be a second meeting on the Empire Photo proposed redevelopment. This meeting will be at the Monroe St Library, Monday May 9, at 7:30. This meeting is being scheduled by Sue Ellingson, the new alder for District 13. Randall School / Olive Jones Park: Pretty amazing work going on here. Check it out at randallschoolpark.org <http://www.randallschoolpark.org/ <http://www.randallschoolpark.org/> > . Make sure to make a donation and help keep this project going forward. New Restaurants: We’ve got Brocach Irish Pub possibly coming to Monroe Street and La Guanajuatence coming to Midvale Plaza (Nakoma / Midvale / Hammersley intersection). Be sure to check them out soon. 5th Annual Bike Safety Rodeo: May 26, 6:30-7:30, Randall Elementary playground. Join Willy Bikes, Madison Police, and the Bike Fed. Contact Troy at troythiel@yahoo.com <mailto:troythiel@yahoo.com <mailto:troythiel@yahoo.com> > if you’d like to volunteer. And finally, redistricting. That silly census always messes things up. In this case, it’s a biggie. We are still in the draft stage, so please weigh in and participate if you are interested. However, it is looking very likely that, effective this July, the southeast portions of Regent Neighborhood currently in District 10 will move into District 5 and that Dudgeon Monroe neighborhood will move into District 13. That means that Shiva Bidar Sielaff will represent all of Regent and Sue Ellingson will represent Dudgeon Monroe and, thereby, become my new alder. I will still represent District 10, but will no longer live in District 10. The new District 10 will include Nakoma, Dunns Marsh, Summit Woods, and Allied, as it currently does. It will also pick up Midvale Heights and Orchard Ridge. In April, 2013, I would have to run against Sue for District 13 or move to run for the District 10 seat (neither of which I am currently planning). My biggest sadness is that state law does not allow these changes to go into effect at the next election. This would not help my issue, but it would at least allow me to continue to represent those people who elected me for the next two years! Not sure if we could try to get this law changed, but probably not in time for this redistricting plan. If you’d like to get involved, please check out the city redistricting website at http://www.cityofmadison.com/cityhall/redistricting/ <http://www.cityofmadison.com/cityhall/redistricting/> . (You can view the proposed maps here as well.) There are three upcoming meetings to discuss the plans. 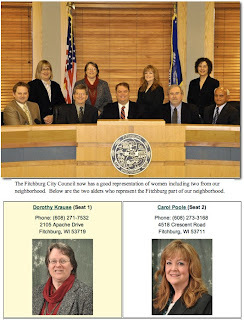 The dates and locations are posted at: http://www.cityofmadison.com/cityHall/redistricting/meetings.cfm. This is very sad for me, as all of you can imagine. At the same time, I see how it is necessary given the population shifts in the city. Both of the “new” districts will be diverse and well balanced. There is a certain grace, I suppose, in recognizing that that is the most important thing for our beautiful district 10 neighborhoods. Wishing you peace and wellness, as always. Editor’s Note: Democrat Terese Berceau is our area’s representative in the Wisconsin Assembly. This is lengthy but very informative - from someone whose job it is to know what’s happening in the legislature. As the Joint Finance Committee (JFC) has concluded its work on the Governor's 2011-13 state budget proposal, I want to provide a short summary of some key provisions. The Assembly will consider the budget as soon as next week. It will then go to the Senate. Here is a quick list of provisions in the current version of the budget, organized by issue area. It's a long list, but don't despair. At the end I've included a list of some budget victories already won! Under the current budget proposal, teenagers will have effectively no limit on the number of hours they can work during a given week; while teens will be prohibited from working during school hours, 17- and 18-year-olds will be employable upwards of forty hours each week! (Children under 16 years of age will be capped at 40 hours of work per week.) I fear this change will result in teens working more and more hours each week and earning lower and lower grades as a result. · Reopen the "Las Vegas Loophole" in part, which will allow corporations to do business in Wisconsin while avoiding corporate taxes by claiming that they are based in another state, such as Nevada, without a corporate income tax. This will create an uneven playing field for "mom and pop" businesses here in Wisconsin that will now bear a disproportionate burden of the corporate income tax. I am extremely concerned that the budget has a disproportionate negative impact on middle-class and lower-middle-class families in our state. This is particularly true given the cuts that have been proposed for the social safety net programs, upon which so many Wisconsin citizens are relying right now. At the same time, I am pleased that some budget battles have already been won. Thanks to the collection of more than 14,000 petition signatures in opposition to Governor Walker's proposed cut to SeniorCare, JFC (Joint Finance Committee) recognized that preserving this popular, cost-effective program was a non-negotiable for Wisconsinites. It amended the budget to restore SeniorCare funding to earlier levels. Similarly, JFC responded to the unified outcry of local elected officials across Wisconsin, who opposed eliminating our state's recycling mandate. JFC amended the budget to provide funding for recycling statewide. Budgets are moral documents. They lay bare our priorities and outline the vision and values we want for our communities. Walker’s budget fails that test on every level. Instead of showing leadership by bringing all Wisconsinites together to address the challenges we face, the governor is pitting different sectors of the state against each other in a disastrous race to the bottom. There has been a lot of talk of shared sacrifice, but that’s all it is – talk. After all that pain to the middle class, to the working poor, to the elderly and disabled, to education, Walker’s budget still increases state spending compared to the last biennium by almost 6% or $1.6 billion! This is definitely not the Wisconsin way, and I cannot and will not support it. As mentioned above, Governor Walker's biennial budget included a provision to shift Wisconsin seniors off the cost-effective and cost-efficient SeniorCare program and on to more complicated more expensive Medicare Part D plans. In response, Assembly Democrats, led by Rep. Andy Jorgensen (D-Ft. Atkinson) circulated petitions to preserve SeniorCare as is. The short petition drive garnered over 14,000 signatures in support of protecting SeniorCare. Republican legislative leaders have acknowledged the outpouring of support for the program and the Joint Finance Committee eliminated that provision. I will keep a close eye on this program and do everything I can to ensure that SeniorCare funding remains in the final budget. My office recently received some interesting facts and figures from the University of Wisconsin about its impact on our community and presence in the 76th Assembly District. There are currently 1,427 UW-Madison students and 3,094 UW-Madison employees living in the 76th District. Statewide, UW-Madison supports over 97,000 jobs and is reported to have an economic impact of $9.6 billion, generating $474 million in annual tax revenue and $21.05 for every $1 of state support. This information is particularly important in light of the drastic cuts to higher education being proposed by Governor Walker in his biennial budget which slashes $250 million from the UW-System and hikes tuition for UW students. I authored a resolution along with Senator Fred Risser to honor the Wisconsin Women's hockey team on winning their fourth national championship since 2006. This season the Badgers won their third conference regular season title and fourth Western Collegiate Hockey Association tournament title en route to setting a program record for wins (37). They also set a new NCAA women's hockey attendance record this past season, drawing 10,668 fans to the Kohl Center in a win over Minnesota. Republicans recently passed the most restrictive voter ID bill in the nation, in order to erect new barriers to equal and open voting in Wisconsin. Governor Walker signed this bill into law on May 25th as 2011 Act 23. Under the original bill, only identification issued by the state Department of Transportation, U.S. passports, and military IDs could be used for fulfilling the requirements to vote. The bill was amended in committee to expand the types of acceptable ID to include tribal IDs, naturalization certificates, and student IDs – if they have the student’s signature and date of birth (no current college IDs contain this information). A few years ago, a study of Department of Transportation (DOT) records conducted by the University of Wisconsin – Milwaukee found that minorities and the elderly lack drivers’ licenses at rates far higher than whites and younger people. Approximately 180,000 residents over the age of 65 have neither a drivers’ license nor a state-issued photo ID. Almost 80% of black males between the ages of 18 and 24 do not have drivers’ licenses. The figures were 55% for black males of any age and 50% for Hispanic women. Black women, Hispanic men, and Hispanic women between the ages of 18 and 24 had rates between 57% and 66%. A full 35% of Milwaukee County residents do not currently possess drivers’ licenses. They can’t afford or don’t need cars and thus don’t need to be licensed to drive. In comparison, only 17% of white men and women of voting age lacked drivers’ licenses. While the Republican authors of the photo ID measure may not have intended to cause racial discrimination, it is patently obvious that the bill would have a dramatic disparate effect on minorities. Requiring photo ID at the polls would not prevent felons from voting illegally or keep people from double voting. It does nothing to ensure that there are enough properly trained poll workers. Instead, studies have shown that photo ID requirements suppress voter turnout, especially among minority and low-income populations. During debate in the Assembly, it became quite clear that it will be impossible for homeless people to vote, even though the U.S. Supreme Court has ruled they have a constitutionally-protected right to do so. Even if the DOT were to issue an ID to someone without a permanent address, customers no longer take possession of IDs or drivers’ licenses at the DOT counter. ID and license cards are now produced out-of-state and mailed to customers. Obviously, they can’t be mailed to someone with no address. Act 23 also eliminated the provision in current law that allows a registered voter to corroborate for another person. How much will Act 23 cost? The non-partisan Legislative Fiscal Bureau indicated Act 23 will cost around $7.5 million. The new law is expected to have an ongoing cost associated with it, given that a full 20% of Wisconsin residents do not currently have state-issued ID cards. For over six years, Republicans - led initially by the Justice Department under President George W. Bush and later by Attorney General J.B. Van Hollen - have been working to produce evidence of massive voter fraud to rationalize the need for this restrictive voting impediment. The result of their exhaustive investigation has found little evidence of fraud. According to the Brennan Center (at New York University School of Law), there were just seven substantiated cases of fraudulent voting in the 2004 election which represents a rate of 0.0002 percent in the state. In addition, none of the problems could have been resolved through the use of requiring a photo ID. Following the 2008 election, Attorney General Van Hollen’s election integrity taskforce charged 20 people with voter fraud out of roughly 3 million votes cast. A better way to get serious about election integrity, I believe, would be moving to crackdown on voter intimidation and suppression efforts. We’ve witnessed repeated instances of eligible voters being harassed, bullied, and intimated into not exercising their voting rights. Efforts to disenfranchise eligible voters are rooted in some of the ugliest chapters of American history and these malicious actions should not be protected or tolerated in Wisconsin. In light of recent changes in Wisconsin's voter registration and voter identification laws - changes that I fear may weaken voter participation - I have circulated for cosponsorship legislation that would enable Wisconsin to join the ranks of other states that have successfully implemented online voter registration. This would cut costs, improve efficiency and reduce the administrative burden on election clerks. A qualified elector who has a current and valid driver’s license or identification card issued by the Department of Transportation could register to vote via computer on a secure Internet site maintained by the Government Accountability Board (GAB). The bill represents exhaustive and careful work with GAB to assure the safety and efficiency of this program. The result will include savings for municipalities thanks to reductions in manual data entry, and will also result in more timely and accurate registrations. • Only those with a driver’s license or state identification card can use this online system. • The bill requires instant verification of information submitted before the application is completed. • Online registration closes when open registration closes,20 days before the election. States that have online registration handle “Help America Vote Acts (HAVA)” checks automatically as a part of the process. No additional effort is required by the voter or the clerk, helping reduce potential conflicts and improve the accuracy of our eligible voters list. After the Civil War, communities across America first started observing a day of remembrance to honor their fallen heroes. The first national proclamation for a “Decoration Day” was made in 1868 by General John Logan, but initially was only observed in Northern states. Over time, the wounds of the Civil War healed, and today, Memorial Day has come to honor all Americans who’ve died in service to our country. No one knows the price of freedom better than America’s service members. When our troops are serving in Afghanistan, Iraq, or elsewhere around the globe, the last thing they need to be worried about are problems at home with foreclosure, child custody, or other legal matters. That’s why Senator Lindsey Graham (R-SC) and I are introducing the Justice for Troops Act, which connects service members with attorneys who volunteer to represent them free of charge. Many attorneys want to volunteer their time to help the troops, but we need a way to connect supply to demand. Our bill allows the Defense Department to support programs that link volunteer attorneys to service members. There are several existing efforts that our bill could expand, including a military law clinic in our own state at Marquette Law School. Alongside our troops, military spouses and children also make great sacrifices. Last month, First Lady Michelle Obama and Dr. Jill Biden launched the Joining Forces Initiative, which assists military families with common challenges like finding new jobs when a spouse is transferred and enrolling children at new schools. This initiative assists with finding health services, transferring academic records, and working with companies to ensure that military spouses can transfer their jobs to new communities. You can find out more about these and other efforts at www.joiningforces.gov. This Memorial Day, let’s take a moment to reflect on the brave Americans who paid for our freedom with their lives, as well as the equally brave Americans who continue to defend us at home and abroad every day. Growing up in Middleton, I always knew that Dane County was a special place. Our community has given me so much, and has inspired me to give back. I am honored to serve you as your new Dane County Executive. Our home has changed a great deal from when I was younger. Dane County’s population is now 490,000 people and is the fastest growing county in Wisconsin. While determining how to grow at the same time we protect our farms and lakes will continue to be a challenge, we now face new hurdles - - including how the state budget will impact our quality of life for years to come. As Dane County Executive, I will meet these challenges head on – by working with you to find solutions, and without sacrificing everything that makes our community great. My first priority will be finding a way to balance the county budget in the face of deep cuts from the state. Hours after I was officially sworn in, I met with my budget team to begin addressing the changes that may come from the Governor’s budget proposal. We do not yet know the final impact of the state budget, but we know that it could greatly affect human services, more than half of the county’s annual budget. Prioritizing economic development is also key. I’ve been meeting with some of our county’s economic development leaders, including representatives of the Chamber of Commerce and THRIVE, to make good on the creation of my new Dane County Office of Economic Development. And I’m committed to making Dane County a clean energy jobs leader. As the price of gasoline climbs, we must re-double our efforts on creating jobs pursuing innovative, cost-effective sources of alternative energy. I’m looking forward to working with you to achieve these goals. Thanks for sending this [redistricting information] out Mary. Just a correction, under the proposal, I will NOT represent the Madison portion of DMNA. It has been wonderful working with DMNA, and we'll see what happens. I very much would like to continue representing this area, but I don't think that is very likely to happen. I'm still [County Supervisory] District 8. The Madison portion of DMNA would be represented by District 27, who is currently Kyle Richmond. BUT-- county redistricting does not go into effect until our next election, so I will still represent you until April 2012.